Reading the clue that will take them to the Underworld. The guard at the River Styx says YOU SHALL NOT PASS. Mixing my fandoms? Oh yes. It took a lot of tries. My poor front door. Girls sword fighting. Who could ask for more? The Underworld is my laundry room, of course. Blue Foods for Percy Jackson. Trying to kill the Minotaur. …and we ended with presents…. 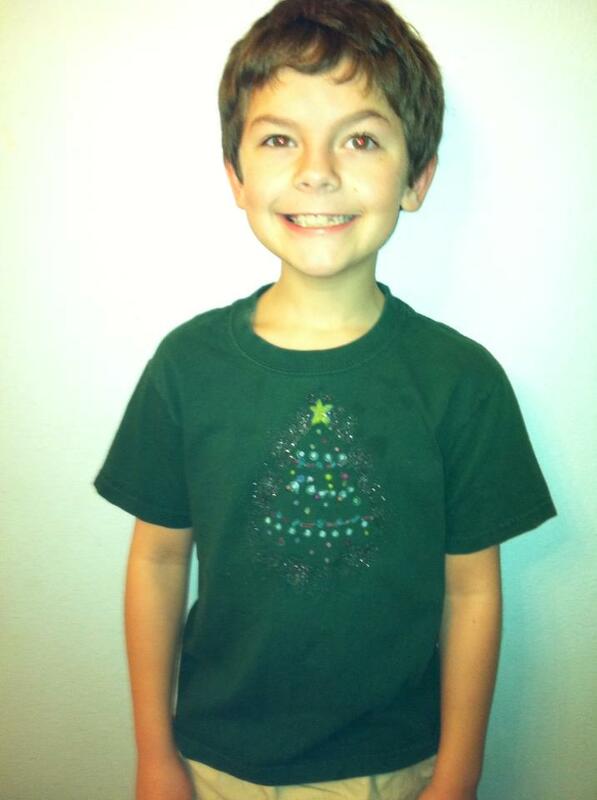 Ten minutes ago my kid announced he needed a Christmas shirt for school. Here’s what 10 minutes and some markers gets you. Finished the CD uploads to iTunes. Put the CD’s in boxes. Put the boxes in the garage. Nick is taking one to his mom and I’m taking the other to Goodwill. Then I put all the little games into the newly emptied drawers and I’m not tripping over them any more. Yay! Finished reading the Albert Campion series and the extra short story books. Now am looking for new things to read. Nothing seems good enough. Listening to The Dead Tossed Waves while I’m at the gym on the recumbent exercise bike. I figured this would keep me going to the gym, but I am finding the narrator so annoying that I skipped a couple of gym days last week. I’d borrow another audio book, but I’m awaiting email from the library telling me what’s gone wrong with my digital account that it tells me I’m no longer entitled to check-outs. Oh well. Back to the gym I go. Must get in shape so I don’t die walking everywhere in Ireland in July. Bought new pretty things for my backyard with money from sale of backyard things we no longer used: a new table umbrella, some pretty chimes, a cushion for my bench, pillows for the bench, vinyl tablecloths for the tables. Also pretty things for the front yard: 3 spinny-flower-things and a set of tiny chimes and a new bright red watering-can. Greg bought seeds, potting soil, tiny plastic pots, and some tiny fences and started planting a garden. We need to transplant those little plants today. Must Not Forget!! We also put a bunch of those seeds in the front garden, but I can’t tell the little flowers from weeds at this point and don’t know what to pull up and what to leave. We did a variety pack and I have no idea what those flowers look like as babies. I worked at the kids old MDO last week. Super fun! Love being with the little kids. Getting money is just bonus! I’ve been watching the last season of Doctor Who over again as I fold laundry the last week or so. Whee! 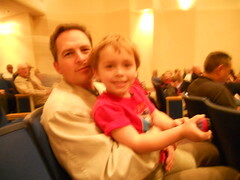 We did another Spring Recital at church. Nick MC’d, his mom and Ben and David all performed, and I made the programs and decided the playing order. It went really well. 🙂 Ben played two beautiful piano pieces. David played one march-type piano piece and another march-style trumpet piece. They both did really well. We also did a clothing exchange at church. I gave away a couple of bags of our clothes and got more than a couple of bags of clothes back. I’m passing some on to my sister-in-law who is similarly sized, but has different tastes in clothes than I do (colored pants freak me out and she seems to love them). I also got a bunch of shoes! Little cute flat shoes! And one pair of platform sandals that are evenly platformed, if you know what I mean. No slope. I can wear them, look taller, and not fall. Must find more of these kind of shoes. Now I’m washing all these new-to-me clothes and watching videos on how to tailor some of them to fit me better. I’ve never done that before. Should be interesting. If I’m not working tomorrow, it will be sewing day! I haven’t been crafty in more than a week now, so it’s definitely time! Photos will appear in the sidebar at some point today or tomorrow. Apparently I haven’t updated them since February?! Aie! Now I have that song stuck in my head. Ok, I’m back now. Oh, it has been so crazy around here. The last time I posted I thought I was on my way to work, but NO, I had a small child feeling all explody in the belly, so we stayed home and snuggled and did laundry, which was good because it was really the last time I did a whole lot of laundry at once and we are now starting to feel that lack. So the day after that was Teacher Appreciation. We had soup catered, but we had to set up and make and put out desserts and make the room pretty and keep the food going. It went really well, but it felt like a super long day. The next night we had an early Valentine’s Day celebration with my family at their house here in town. Greg spent the night there, which he has longed to do for months and months now. Saturday we spent time gaming with my parents (yay Carcassone!) and then went off to church. We ended up having our Pre-teen meeting twice since only a few people showed up at the time we’d intended to do it and then the rest showed up later and were miffed that we hadn’t waited for them so we did it all over again. We stayed late for Open Gym Night and the kids ran around like mad things while Nick and I taught a new guy how to play Settlers of Catan. Gaga Ball has nothing to do with Lady Gaga, I promise. One of the church elders taught it to the kids, having learnt it at another location. The kids LOVE it! I totally can’t remember Sunday at all. I think we hung out with my parents, then cleaned house. Whee! Mrs. A. put together a whole crime scene for the kids to explore bits from. It was very educational. Monday was the start of Book Fair Week, which is extra crazy here. I spent the day at home resting up for the craziness to follow, then after school we went down to the library to participate in a Crime Scene Investigation with one of the teachers. It was super fun! Tuesday I spent finishing up projects and then went up to set up for the school’s Fine Arts Night. PTA was serving a BBQ dinner and the book fair moved into the cafeteria for the night while the kids had all sorts of performances and things to do. There was a segment in another room as well, but it was in the dark doing static experiments. 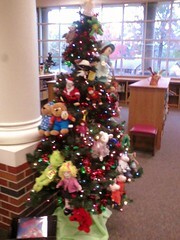 Wednesday I volunteered down in the book fair for 4 hours. I love talking to kids about books and helping them out. I went straight from there to the middle school to help work FLEX day. Wednesday after school was Mad Science with the Mysterious Master Morrow. That was a lot of fun, too! Thursday I spent another 4 hours in the library helping with book fair, then headed off for a doctor’s appointment and to deliver Valentine’s to a few friends. I had an adventure with the van not starting and my friend E rescuing me. Later, the younger kids had ALL THE CANDY after school, but we managed to share some with David as well. Nick made me special Fried Pickles for dinner. Friday morning we got up and got ready for the Storybook Character Parade. I’d missed the note that came home saying the kindergarteners were not participating, so Greg was the only one that walked in the parade. Greg went as Bob the Builder and Ben went as Jack from Magic Treehouse. Most of the rest of the kids went as Nerds. After the parade was over, I headed downstairs to kindergarten, then onto the bus to chaperon their trip to the planetarium. We had a good time there. Well, most of us. I sat next to a kid who really thought the sun was going to burn him & started freaking out. The museum had an exhibit on bivalves, a bone statue of the smallest T-Rex ever, a giant 3000 year old Mayan mask, and a bunch of blocks leftover from an Egyptian exhibit. It was quite trippy. We also got to tour the museum and see a real moon rock. 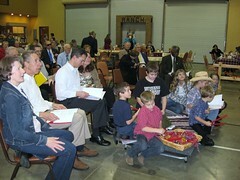 Friday was also the start of the church’s regional weekend. There was a hymn sign that Nick and the kids went to. I was exhausted, so I spent the evening blissfully alone. Saturday we had church early and our choir sang “Down By The River To Pray.” I think we did pretty well. Then there was a potluck. Nick taught Sabbath school while I helped the kids find verses. Then I led the kids in crafts while Nick helped. That night there was more dinner and then a variety show and dancing. I danced up a storm with my little nieces. 🙂 I hope someone posts photos later! On Sunday there were sports for teens and adults. Nick lead the pre-teens in sports while I lead the ones that didn’t want to play in craft time. It was a really good weekend, but oh so busy! I guess I should catch up with the rest of the week first. All righty then! Wednesday I went to the doctor for my physical. We talked about many things, like my meds (they’ve changed), my blood pressure (it’s happy), my anxiety (lessened by meds, yay! ), weight loss (uh, yeah), and my heart condition, which was the surprise topic. Apparently I have one? Or might? In any case it led to more blood tests on Thursday. We’ll see what they say. As I was leaving there the nurse from the school called and said Greg’s shoes had exploded and could I bring new ones? I could not, so he borrowed some from her. My mom took him and Ben out and got them more shoes that afternoon while David was at meetings at school. Thursday was a sick-kid-at-home day, but my mom watched him while I was out. Pathetic Greg. This was in the morning while he was still feverish. By mid afternoon he was doing all right and we watch Sofia the First on the Disney channel, which he loved, while snuggling. 🙂 That evening we went over to my parents house for dinner and a game of Cargo Noir, which went on for hours and hours. I don’t even remember who won. It went on so long that Ben and Greg both fell asleep, so Nick and I had to carry them home while David carried all our stuff. I’m sure we made quite a sight on the street. Friday I had a sick Ben at home…or rather, at Grandma’s house in the morning so I wouldn’t have to miss my coffee date with the neighbor yet again (we’ve been back and forth and back and forth with changing dates due to sick kids. We live 4 houses away from each other and have not managed to see each other since Thanksgiving). It was a lovely morning with muffins made by a different neighbor. 🙂 Friday afternoon I brought Ben back home and he was much recovered. Friday afternoon we had the Scouts over from our Pack and taught them Fire Safety in our side yard. It had rained enough this week (all week long) that everything was nice and wet and safe, but we still made them clear the ground cover before starting the fire. Ben and S. work while M. reads the newspaper. How is this fair?! See the children. See the children jump and play. Jump, children, jump! Then that evening we had my parents over for dinner, as it was our last evening together before they had to go back home and my dad had to start teaching again. Yummy yummy cheese platter. I’m getting good at throwing those suckers together. 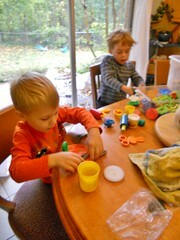 Saturday morning we hung out with my parents again and made them play Creationary with us. We’ve discovered that it is supremely hard, even using just the basic cards. David’s the only one that’s any good at it. Our church had Teen Day that afternoon, with all the kids in the Teen Group serving in places that adults normally serve, like being Greeters, Ushers, Song Leader, Prayer Leader, and Pianist. It was pretty cool seeing all our kids do that stuff. David is counting all the people in his section as part of his duties as Usher. 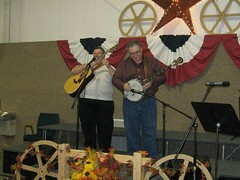 After services were over was our church’s Mexican Potluck and Variety Show. (I still need to offload videos, but some of them are pretty shaky.) Our congregation has been hit pretty hard with the flu, so two of our major performers/accompanists were out sick, which left us with some holes in our program. The Pre-teen Group sang Old MacDonald. We had zero rehearsal time; this was just for fun! They’re even wearing flower pots on their heads as hats. One of the animals on our farm was a hippopotamus The snorting was SOOO cute! David played an excerpt from the William Tell Overture on his trumpet right after doing a skit with all the other kids. I don’t have a picture from that one, but it was a hilarious scout skit and the high point was David running off stage with a roll of toilet paper in his hand. The rest of us have spent our day cleaning house and getting ready for the next week. And that is that. Hope y’all are having a great weekend! Last Wednesday we didn’t have a lot going on, which was good, as I was still recovering from Icky Tummy. Greg had a short playdate with his friend Kya. We were late, then they needed to leave early, but they had fun in the backyard! 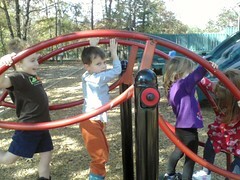 Lots of climbing on the jungle gym the way it wasn’t intended to be played on, of course. 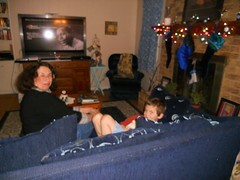 Then I caught up on housework, Greg caught up on My Little Pony watching, and the big kids had school. Greg & Kya both fit on the swing in her backyard! Too cute! Friday turned unexpectedly busy. More Spring Recital errands, more just-for-us errands. Greg got a new toy with his own money at the dollar store. 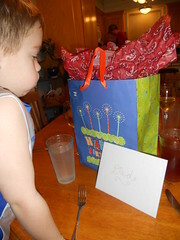 We had my “birthday lunch” with Nick at Oliveto’s (I had a birthday coupon!). Then I went up and had a conference with Ben’s teacher because (prepare yourself for the shock. No, really, prepare yourself!) Ben had been challenging the teacher and substitute teachers authority. My Ben. For real. It turned out to be no big deal, but apparently he’d had a hard week, there’d been a mix-up with the sub paperwork, and it just spiraled from there. *sigh* After that was an impromptu PTA meeting (announced in the funniest way: “Let’s go to my house and drink beer in the front yard while the kids run in the street!” whee! note: the kids did not actually run in the street, nor was it an official meeting). After that I took the kids to the PretzelMaker in the mall, to use our birthday coupons there, whereupon we were treated unkindly by the establishment, they denied looking at our official documents proving our dates of birth (which I’d brought just in case because it can be awkward when two in a family have close birthdays), but they gave us our free pretzels eventually. Greg's cool new toy. It's already been repaired five or six times. Nick and I take turns repairing it now. Yay for cheap toys. Saturday was busy as well. 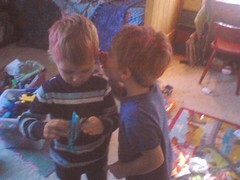 Ben had a birthday party for his friend L. to go to first thing in the morning. It was in the backyard and I got to spend my morning chatting with my friend R, who I don’t see enough of, which was lovely. The cake was a mint chocolate chip ice cream cake (homemade). So very yummy! This was the Pokeball Drop game at Ben's friends Pokemon themed party. It was a gorgeous day for a party. Saturday was also my solo debut doing special music on the piano. I’ve done quite a few duets with Nick’s mom, but never played on my own. I was so nervous and shaking so hard I could barely play. Everybody later said that it was beautiful and soothing music (I played Savior Like a Shepherd Lead us from the Simple Hymns book. I’d originally planned to play a more complicated version, but with the RA flare, I decided to go simple). Hehehe. After church I managed to spill an entire cup of hot tea down my front, burning myself across my belly, thigh, toes, and hand. It was really quite painful that first day and continued to be painful in spots for several days after. Sunday was the big day of the Spring Recital. The kids and I practiced, practiced, practiced, then loaded up all the munchies for the reception and drove out to church, whereupon we started set up and rehearsal. We had some great people come out to help with sound & kitchen stuff, for which we are very grateful. The recital went very smoothly. My parents and Nick’s sister and dad came. Nick did a great job as MC, the kids did excellent at their various instruments (Ben played three pieces on piano, David played one piece, three ways: piano, violin, & recorder), and my clarinet solo (the adagio section of Weber’s Clarinet Concerto No.2) went off without a hitch (playing the clarinet in front of people is a breeze; why is it so difficult to play the piano in front of others?). There were tons of other refreshments there (we were worried there wouldn’t be), so we got to take home lots of goodies, too. My parents cooked dinner for us afterward. Me, in my new dress, playing clarinet. I still need to work on my posture, apparently. Yesterday was another busy day (they all are lately, it seems). Got the kids off to school, then headed over to Rose Stadium for the area 5th grade track meet. Someone was really thoughtful this year and brought a tent for the parents to sit under (in the bleachers, which I thought was a bit weird, but all the schools were doing it) so I didn’t quite die from heat. Got some quality time talking with my friend Lea, which is always good. David ran the 800 meter race and came in 7th, which was an improvement over last year. I don’t know why he keeps getting signed up for that one; he’s much better at sprinting. 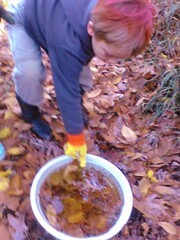 He had a lot of fun, though! I took advantage of a 10 minute lull in my schedule and showered before heading on to other things. Other things being: kid pick-up, Lego club, buying a present for David’s friends birthday, taking the kids to piano lessons, then yet another PTA meeting (last one before the spring carnival! ), then the aforementioned kids birthday party. The birthday party was interesting because it was at a pizza buffet and we’d gotten a call earlier in the day that they were going to discount our meals by about half, but we didn’t know why. Well, come to find out they were filling spots for commercials. So we had to do all this cheering and present giving over and over and they interviewed some parents and generally were in the way with their big camera and lighting set up. It was chaos! May 2, 2012 Lisa H.
When I first made my list earlier this month, I had no idea that I’d end up having the kind of week I have scheduled ahead of me. Monday I have a two-hour webinar for scouts, Tuesday I’m going to spend all day driving to and from Dallas with David, getting his back checked for scoliosis, Wednesday I have a half day playdate (planned for two weeks ago, then rescheduled) to catch up with a friend that I haven’t seen since my birthday last April, Thursday I’m going in to the hospital to have an EEG done to see if I’m having mini seizures, and Friday I’m having another catch-up playdate with a different friend (also rescheduled) who I thought I’d seen this month, but apparently haven’t yet. Now the children are home, it’s lunch time, and we’re digging through drawer 2 of the second cart. We may have to stop to do tie-dye before we move on, since it takes up a lot of space and the children would rather we tie-dye today than throw it out unused. I agree with them. If only we had some white t-shirts. Off to check for shirt availability. An hour later, Nick has gone off to work and I have finished emptying the second cart. Another trash can has been added, as the first one is FULL. The tie-dye did not pan out, as only one kid has a shirt available for it. The top of the desk is left to do, as is finding a home off the floor for all the paper products (which do not fit into the desk). Another hour later, because I’m about to pass out and this may be the last update of the day. The two younger kids have been very good helpers, as evidenced by the quotes above (you all knew that was Ben & Greg, right?). David got mad about 3 minutes in because I wouldn’t let him keep his large supply of sticks in the garage any longer. He left to take a giant bag of Lego bricks inside (why was it in the garage? no idea) and never came back out again. Greg and Ben helped me break down boxes, sort things into recycling bins (certain things can go in the one that goes out to the street that can’t go directly to the recycle center and vice versa) and the dumpster, and sort other things into whose room in the house they belonged to for once they go back inside. Now we have a couple bins of things that go back in the house, which worries me a bit. But the garage has been tidied up a reasonable amount, my trunk is full of more stuff for Goodwill, and in a few minutes it’ll also have been swept. And then I’m going to go lie down on the couch and watch The Secret of Moonacre again with Greg because it is a delightful movie and I am exhausted. Well, another hour has gone by and I haven’t passed out yet. The kids didn’t want to watch a movie just yet. “It’s a lovely day, Mama!” And it is. Breezy, warm. Non-standard January weather. They wanted to ride bikes in front of the house. Sure, why not. Well, here’s why: we tidied the bikes into a figurative corner and couldn’t get them out without getting the van out of the garage. As long as the van was out and there was more space to move around in, why not reconfigure the garage so the bikes are easy to get to and the van seats (which rarely leave the garage these days) are less open to the elements? So the kids got their bikes out, I shifted the other stuff while they were riding, et voila! Now they can get to their bikes & helmets & padding on their own and I, thanks to some hooks hung on the wall to contain their never-used golf sets, have comfy seats inside the garage to watch the festivities from, out of the sun and elements. Wahoo! 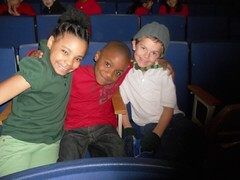 January 22, 2012 Lisa H.
Thursday last we had a double crazy day. I baked 6 dozen cookies over the course of the day, those yummy apple caramel cider ones I did last week, but this time with the chunk caramel rather than the bits. Oh what a difference the chunk caramel made! They went from yum to superextrayum! After the kids came home from school we decorated the cakes they baked the night before and that morning. That night Nick took the kids to their cake auction while I went to a cookie exchange party at one of the newer neighbors houses. I didn’t know most of the people there, but the kids did enjoy playing together and I came home with some fabulous cookies. (photos to be added once I find them) Nick came home with some other kids cake, as he was outbid on our kids cakes. They totally loved that! Friday was the quadrupaly crazy day. 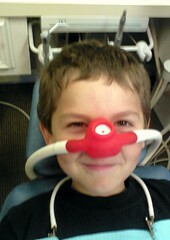 Ben had eaten one of the caramel chunk cookies without warming it first and his crown came out so he had to be taken into the dentist first thing in the morning. Also in the morning there was a concert at school for all the kids and parents that hadn’t gotten to see/be in the big performance the week before. My mom took Ben to the dentist and my dad, Greg, and I went to save seats at the concert. Ben and my mom got back before the concert started but too late to sit with us. David got to play his violin in public for the first time and did very well. and a Left/Right gift exchange (I wrapped extra gifts in case they were lacking some and passed them out to younger siblings afterwards). It was a great afternoon, but I was exhausted and out of breath by the time I’d climbed all those stairs a half dozen times (sometimes I’d walk the extra distance and take the elevator, but it was pretty far away). My parents picked us up straight from the time the bell rang and drove us down to Palestine for our annual trip to ride The Polar Express. The kids were likewise dressed in pajamas. This year it was freezing cold, so everyone wore their jackets, except Greg, who tried to live inside my robe. After the train ride we changed up tradition a little and ate dinner at Giovanni’s, which is right next door to Little Mexico (where we normally go). We have no photos of Saturday at all. Aren’t you feeling happy about that by now? Sunday Santa’s helper Elmer the Brownie visited our house. When he saw we were all decked out for the holidays, he brought us yummy cookies. Monday we made some graham cracker houses (and used up all the leftover candy from the class parties). Yesterday we got The Call and left for College Station a day early, thinking that Steph’s baby was on his way. Sadly, he wasn’t yet (she was more than a week over due), but we did get in a little visit today and she opened his present from us (which was partly something to be used on Christmas day). Tomorrow I’ll post some more pictures. Aren’t you excited? So after the Boring Post of Boringness, things finally got interesting. We were going to go straight home for him to rest, but he was antsy so we went to the mall and looked for a present for his grandparents while we waited for him to stop being drooly and start being able to eat. Once he’d regained feeling, I fed him lunch (his lunch time is really early and he wasn’t done being numb by then)and took him back to school. I took no pictures of his drooliness by his request. Then I headed off for my piano lessons and the rest of the day. Friday morning I got a text from my long lost friend Monaca asking us to go out for coffee, so we headed out to Einstein’s bagels. (If you sign up for their e-club they’ll send you a coupon for a free bagel with schmear with any drink purchase. I also have a refill cup there, so my refill only cost $1, which wasn’t quite as good as the promised 50c refills, but better than $2+ for coffee. No, I’m not being reimbursed by them to say this. I also signed up with Panera Bread for their card and got a free pastry coupon from them, too.) Greg got an “everything” bagel with strawberry cream cheese on it. It was pretty gross. My whole wheat with onion spread was delicious. From there we left for our regular Friday playgroup. This time we met at Pollard Park, which we’ve been going to since before Ben was born. It’s gotten pretty run down in its wooden seating areas, but the playground itself is in great condition, so the kids love it there. It was much cooler at the park than it was at my house. I’m surprised Greg didn’t freeze to death (he had a jacket and refused to wear it). I ended up wearing someone else’s blanket as a shawl the whole time we were there. 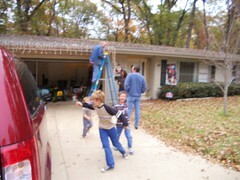 My parents came into town again, so we hung out with them after school (though not that night, as Nick was making chili and I was baking cookies) and the next morning helped them put up lights outside. 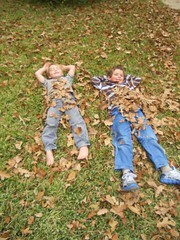 The kids, naturally, ran around and tried to drown each other in leaves. 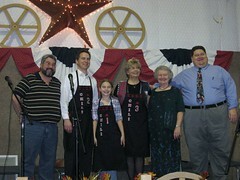 That night was the Chili-Cook-off and Sing-Along at church. Nick made a super yummy, super spicy chili for the event. He won 2nd place! We all had a great time singing along and enjoying the entertainment afterwards as well. I love live music, so it was a super fun event for me. I admit to not taking any of these photos. I was too busy enjoying the event. They were either taken by Lupe Gonzales or Laura Moody or maybe even both. I am so fortunate to have facebook friends who take event photos and let me mooch off of them. The kids sitting in front of us (I don’t know their names, as they’re not from our immediate church,but were visiting from nearby) were hysterical. They danced and danced. 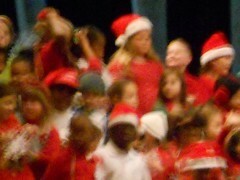 Our kids actually got up on stage and sung with the whole group at some point as well. Sunday my mom, dad, and I left the boys at home with Nick and went off to do our Christmas shopping. It was CRAZY out there. I hate shopping near the holidays. Afterward we came home and the kids and I cleaned up the house while Nick cooked. 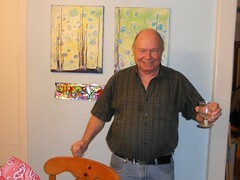 Then my parents came over for our special birthday dinner for my dad. I love this next photo because my dad figured out that if you time it just right, it seems like you’re blowing out the light-up candles on this bag. He’d press the button, let the song play, then say “Blow them out!” and Greg would blow on the bag and the lights would stop. It was so cute! Monday was another day with A. It was, of course, raining, so we had to figure out some indoor things to do. I was beginning to realize at this point that I was having an RA flare, so I convinced everyone to go to scouts all together in one car at one time that night instead of me coming up and bringing someone halfway through the evening and taking someone else home. It was so very nice not to drag myself out of the house again. Oh so nice. Incidentally, the kids got all their reading done this week. Haha. Evil mommy plan worked. Tuesday night was a joint performance between our school and one other’s 2nd & 3rd graders of a program called “Flakes.” Ben was sad he didn’t get a speaking part, but he’ll have other chances. I was going to post a video of the program, but I’ll be honest here: you can’t see my Ben (or the kids next to him, for that matter) at all. The kid in front of him was a) taller than him and b) wearing a huge hat (which they’d said they wouldn’t let kids wear, but with 300 kids up there, no one was paying attention to that). It was ridiculous, but there’s nothing I could do about it. The program was cute enough, but you don’t want to spend 20 minutes watching a shaky video where you don’t see Ben, right? Right. Moving on. We were supposed to go to the library again, but it was Circus Day and A. professed a fear of clowns, so we stayed home and played inside and sprayed ourselves with colored hairspray. And told each other silly secrets. That was important. And silly. 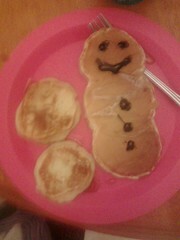 This morning we got up and, inspired by a friends pictures on facebook, made fancy pancakes. We also made heart shaped ones and a reindeer. Ben helped me with a lot of the process: measuring, mixing, pouring batter into the pan, and keeping the already made pancakes warm while I made more. December 8, 2011 Lisa H.
This week has been pretty boring. I know I should be thankful for boring because the next few weeks will be anything but, but really it was just not that exciting. Monday we had A. over again for babysitting. The kids played, watched TV, ate lunch, all that kind of stuff. Nothing to report, really. No scouts that night because Nick was off talking to his mom’s class. The kids and I watched another Christmas movie. Yesterday was another A. day. We took him to the library and he did really good. As we walked in he yelled “SHHHHH!!! 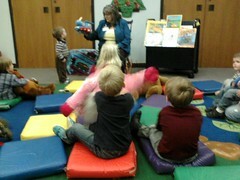 WE”RE SUPPOSED TO BE QUIET IN THE LIBRARY!” and then was quiet ever after. I laughed hysterically. We did story time, a craft, picked out books, all of that. It went well. Got home, ate lunch, and off he went back with his mama. We spent the afternoon splashing in puddles outside and taking pictures of our toes. After school we had a triple playdate with two of Ben’s friends and one of David’s. 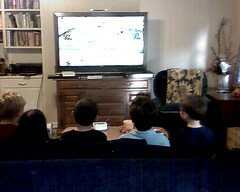 Mostly they played Sonic: The Black Knight (or whatever it is called; I bought it, you’d think I’d know, but nope). And now you are all caught up. December 1, 2011 Lisa H.